Marcon Place E8 is Waugh Thistleton’s first built project for Pocket, and Pocket’s first endeavour in Hackney – working together proved a perfect match. We’ve done a good amount of work in the Borough, and Pocket knows the way to getting good quality, fairly-priced housing in the areas that people want to live and work. At the forefront of Marcon Place E8 was always the commitment to strong design, so we worked closely with the team at Pocket to create smart, thoughtful, and welcoming spaces. What ultimately developed is a design that proves that high density housing can employ natural materials, a human scale and a generosity of communal spaces. It proves to residents that there need not be a compromise in the quality of accommodation required to enjoy the benefits of central London living. 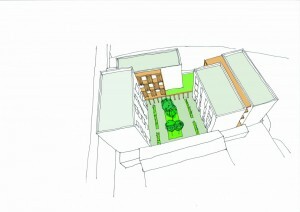 Marcon Place’s 31 homes are arranged in four blocks around a landscaped courtyard which forms the heart of the scheme. This common outdoor area inspires community living and gives Marcon Place that splash of green all tenants desire. Unlocking London’s Housing Potential – what more can we do? Last year, the London Chamber of Commerce and Industry (LCCI) produced a very useful report into housing in London, ‘Getting our house in order’. The report aimed to build a ‘business case’ for the creation of more homes in the Capital, noting the urgent need for more homes at all levels in London, and urging Government (national, regional and local) to work together to deliver more homes for London’s workforce. This week LCCI has published a follow-up paper, ‘Unlocking London’s Housing Potential’, focusing on one of the main recommendations in their original report – the release of public land for housing. Public land release is especially important for the development of affordable housing yet, as Pocket is quoted as saying in the report, it can take up to four times longer to acquire land and planning on public sector sites in London than private acquisitions. This can be crippling for a small developer like Pocket. Is it really a compromise to have less living space? The London property market is getting more and more expensive, so it makes sense that young buyers are finding they need to ‘compromise’ to get their foot on the housing ladder – moving to less popular, less central areas is all part of London’s evolution, and buyers are expecting less and less space as they go further out. But is having less space really a compromise? More space costs more to furnish, more to heat, and gives you more room to keep more stuff, while today’s young workforce is trying to minimize all of this. Are we suffering from Stuffocation? Technologists tell us the reason why we are turning away from material goods is, actually, because we can. After all, what’s the point of owning physical books and CDs when you can access them from the cloud?